Overlooking the Potomac River, the Belle Haven neighborhood is one of Alexandria, Virginia's more sought after communities. Located just south of Old Town and to the north of George Washington's estate at Mount Vernon, the quiet, tree-lined streets and serene setting belie Belle Haven's convenient location to Old Town, DC, and the Marina. Residents can easily walk to the library, county recreation center as well as corner grocery stores. 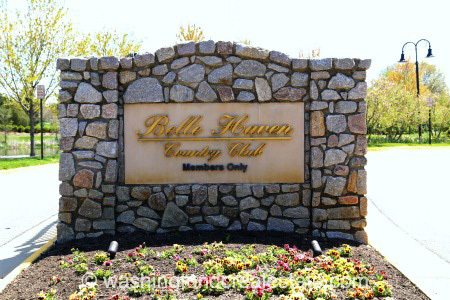 Belle Haven also overlooks the Belle Haven Country Club which provides members with dining, golf, tennis, a clubhouse and a 2500 sf fitness center and spa. Dating from the 1920s, Bell Haven takes its name from the Scottish pioneers who settled along the Potomac River in the early 1700s, naming the picturesque settlement after their favorite countryman, the Earl of Belhaven. Properties in Belle Haven span a number of architectural styles ranging from luxury homes and newly built estates to smaller cottages and townhouses that are scattered around the Country Club and surrounding parks. Many owners have renovated their homes to include in-ground pools and work-out rooms. Others take advantage of the nearby Potomac Bike Trail to get in their cardio workout or dock their boats at the nearby marina after a lazy sail. With public and private schools that are some of the best-rated schools in the nation, Belle Haven continues to be popular choice for families. Belle Haven is bounded on the west by Richmond Highway (U.S. 1) and on the east by the Potomac River.